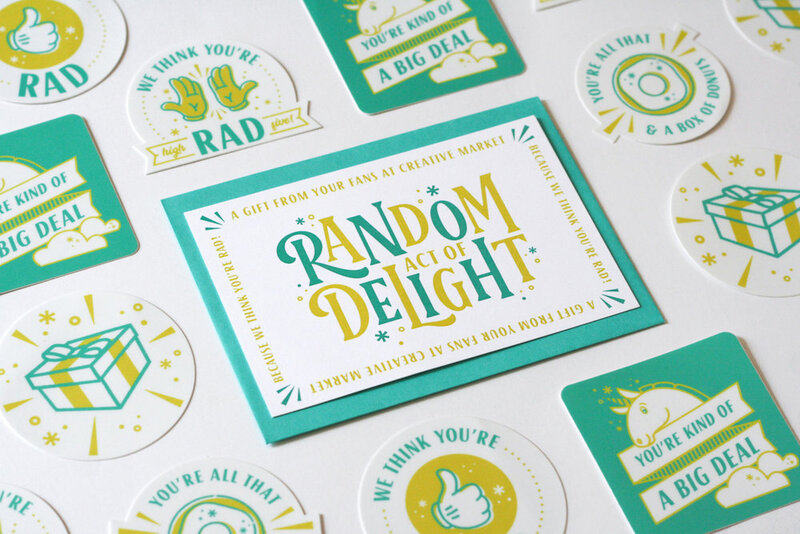 I had the opportunity at Creative Market to design a sub-brand for the Community Team’s “Random Acts of Delight” campaign. The purpose for the campaign brand was to create digital and printed resources for the Community Team to delight shop owners with. Using these materials to connect with shop owners would create a stronger relationship between the brand and the shop owners that drive Creative Market’s growth. I designed a set of digital stickers and celebration ‘cards’ that our Community Team could share with shop owners via social media. We produced printed stickers, custom tissue paper, cards, and a rubber stamp. The Community Team used the printed and digital materials to send celebratory care packages to shop owners who reached significant milestones.